Transform tired dogs into perky pups that look and feel like you just left the spa. If you have dry feet, cracked heels, or rough skin brought on by long work days and lack of attention, then this is the product for you. 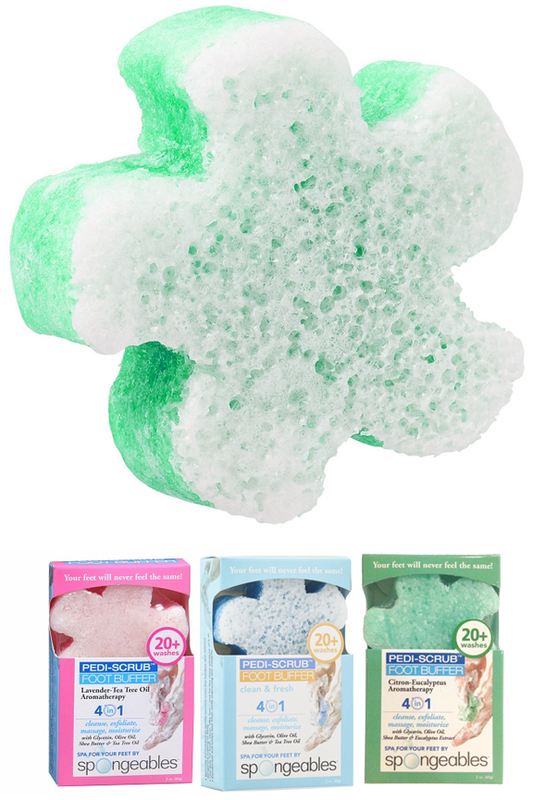 It is a 4-in-1 treatment that can be used everyday to clean, massage, exfoliate and moisturize your feet in one easy step. It is actually a premium quality foot scrub and spa quality applicator in one, so it saves time and money while producing amazing results. Simply get it wet to build a creamy lather and then wash your feet with ease. The colorful side provides a gentle massaging action to relive aches and pains, and the white side gives you exfoliation power that eliminates dead cells and smooths rough skin. The superior ingredients are enhanced by aromatherapy quality fragrance, and moisturizers that actually hydrate as you clean. The end result is softer, more healthy looking skin on each foot, and a fresh and youthful feeling all over. Get at least twenty uses before the soap runs out, and keep on using the buffer even longer. Your feet will thank you when you start using this professional quality pedi-pampering tool. Cleans and moisturizes from heel to toe. Scrubs away stubborn dirt while retaining and replenishing moisture. Massages away aches and pains and relieves tension. Reduces dry skin by scrubbing away dead cells and hydrating the area in the same step. Revive and smooth cracked heels. Remove hard skin without cutting or filing. Deodorizes and freshens to make stinky feet smell good. Patented infusion technology combines superior soaps and moisturizes with the tool you will use to apply it. Instead of squirting foot scrub onto a buffer that costs extra money, you just get this one wet to release the perfect amount of soap for each use. This adds convenience, reduces cost and allows you to do a better job in less time. 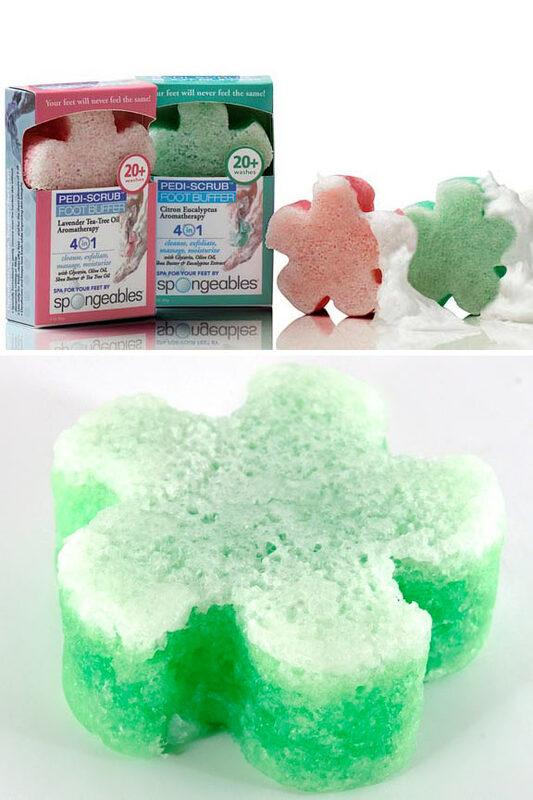 Because the sponge has soap baked in, it will feel stiffer to the touch when compared to regular ones. This provides a slight massaging action as you wash, and allows you to use the perfect amount for each application. An added exfoliation pad will give plenty of scrubbing power for any dirt you encounter, but it will also invigorate skin, increase circulation and remove dry or dead skin with ease. You simply wash your feet like you normally would, but instead of just removing the dirt, you will be softening skin, revealing youthful layers, adding moisture and making your little piggies smell great. The combo of the cleansing ingredients and the sponge together will produce the best results, but the tool remains useful even after the soap runs out, so add your own body wash to get even more uses. Remove from box, and take off plastic wrap coating. Get in bath or shower and wet foot. Completely saturate Pedi-Scrub to soften and allow for release of ingredients. Squeeze in your hand a few times to build up bubbles and give your self a rich and creamy lather to wash with. Use the softer side to clean and moisturize. Flip to the exfoliating side to eliminate dry skin and massage away tension. Rated for twenty or more uses. 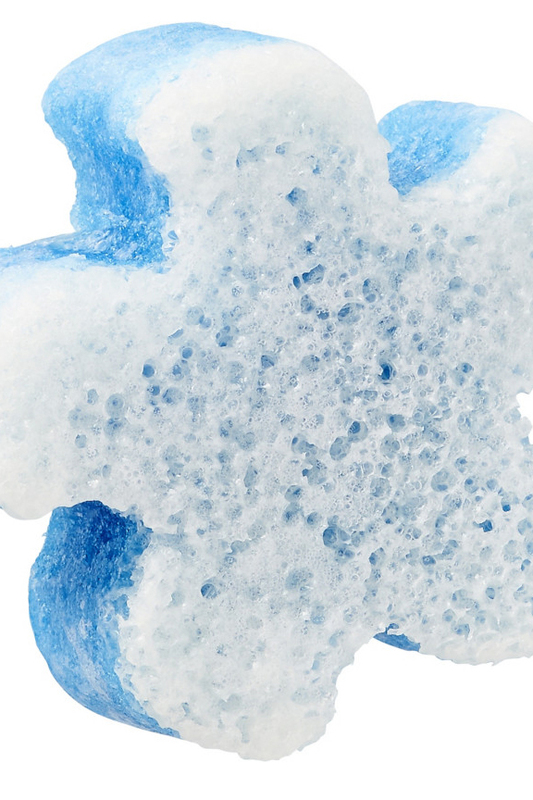 Sponge can be used longer when more soap or body wash is added. When finished, rinse lightly and then squeeze out excess. Allow to dry for later use. Dimensions 3" x 3" x 1.25"
Ergonomic Shape Yes - Thick sponge with rounded edges is easy to grip and hold on to. Give your feet a spa treatment everyday. Aromatherapy fragrance combines with premium soaps to wash your feet, while a spa quality sponge exfoliates at the same time. Tired feet will feel rejuvenated, and dry rough skin will be eliminated. Get at least twenty uses out of each sponge. Order Yours Today! I really like this item. It helps to keep my heels nice and smooth and really feels great when washing your feet with the buffer side. Since it already includes the soap, you don't need to be adding anything to this. It's really a nice convenient item to have in the shower! Great foot exfoliations in between pedicures! My feet have had a complete transformation! The bottoms of my feet, the cuticles around my toes, my heels....I could go on and on. LOVE this product and will NEVER be without it!! A Compact, Spa Quality Foot Washer, Massager & more.